B/R Quarter Horses is no more. My stallion, Boston Supreme a 1975 colt, died August 28, 2003. We enjoyed many years and a lot of great experiences showing and breeding him and even stood him at Quarter Horse Congress on "Millon Dollar Stallion Avenue" a few times. His off spring have gone on to make their owners proud and he is even listed as a leading earner as a maternal grandsire! I enjoy hearing from all of you who email to tell me of your horse experiences along with how you were introduced to your first Aussie. Darla was actually my first Aussie that I showed in performance, then Baron. 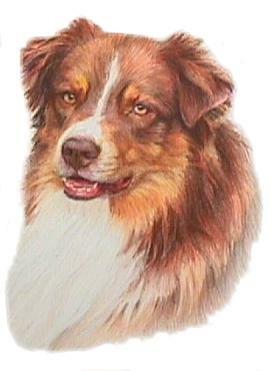 My Aussies have always been family companions first and then a "show dog" if they enjoyed it. I have raised Whippets and Great Danes and that's how I was introduced to showing conformation at AKC shows. We would show horses all summer and dogs in the winter. It wasn't until Baron came along and I made a comment to my herding instructor that I was going to neuter him (he was 6 months old or so at the time) and she said to take him along to a show and put him in. Well, that's pretty much how this all got started. Judi Bigham, my herding instructor, and I laugh over that now! Baron's mother goes back to Judi's Hado Bar Jill. Plans are in the making to turn the farm into a herding center. Ducks, sheep and even cattle will be available. My family has recently purchased a small herd of Dexter cattle and I can't wait to get the dogs on them. We had a few Holstein heffers here a few years ago and that was fun. I have raised Indian Runner ducks and have St Croix and Barbados Blackbelly sheep for the dogs to work. CH Del Rae's Senna of Sunsong, CD, PT, NA, NAJ, RN, CGC, TDI , JHD. Rest in peace my sweet boy......I will forever miss you!!! March 1997 - October 2009 view the tribute to Baron page! Congratulations to all the owners of the following dogs that have put the time and devotion into training their own dogs and showing them to these titles. For many of them, this is their first show dog. Again my congratulations to you all! Because of you I have been recognized by AKC as a "Breeder of Merit" note: Dogs titled by myself or by professional handlers are not listed here.